With a new subscription box hitting the market soon, you're probably wondering if the Fibre Muse Alchemy Kit is worth signing up for. 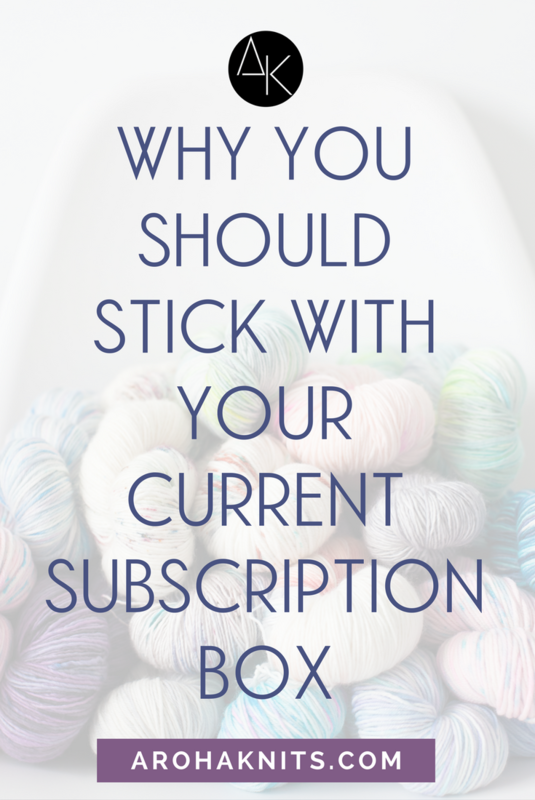 And honestly, you're probably better off with sticking with your current subscription box. These subscription boxes have been around for a much longer time and have a large consumer base, allowing them to expand their businesses and upscale. What does that mean? More customization and options for you! Not just in the yarn color ways, but the brands they work with. They can offer several patterns per box from different designers because they have the resources and reach. Because they have a larger customer base, they have better negotiation power for the items they curate for their boxes, resulting in deeper savings for you. Which is the whole point of a subscription box: you want to get great value each month! The Fibre Muse Alchemy Kits offers value in a different way. While we aim to save you money on each kit, because we have chosen to work with small/indie, artisan, handmade, local businesses in the Fibre industry, the payoff for quality, unique products crafted and created with love and passion, is a higher price point. So I totally get it if the Alchemy Kits will be priced as a luxury item - because they are! And because we're limiting subscription sign-ups to only 100 spots for the first launch, our negotiation powers are not going to be as influential (why would a maker want to give us a deeper wholesale discount when my audience is much smaller compared to the bigger box brands? And I don’t believe in paying just with “exposure"). However, we believe in paying makers what they are worth and collaborating in a way that is fair to everyone involved and contributing to the growth of the Fibre industry, especially the small brands. But why should you care about the growth of the hand-made industry? It's more expensive and not as convenient and you're iffy on the quality of customer service and the product you’re buying. At least you know machine made is consistent! Hand-made, local or artisan are just buzz words to you and you don't really care that much (and maybe we *should* get real jobs!). And you know what? You're totally in the right to feel that way - because you’re not wrong. But if you do care deeply about the Fibre industry and want the excitement that comes with hand-made, unique items, a tight-knit community, then the Fibre Muse Alchemy Kits may be right up your alley. Join the VIP launch list to be the first in line when the kits go live. The first SWATCH Studio KAL is just around the corner - cast on day is October 10th and we now have our list of designers and their patterns! Please take a moment to read and look through all of these wonderful and creative designs and pick a couple to work on during the KAL! We have a nice assortment of hats, shawls, socks and cowls! And yes, we do have a wonderful collection of prizes for those who complete their projects - varying from yarn, to project bags, to stitch markers and patterns! Stay tuned for a listing of the prizes and the brands who donated them! To participate in the KAL, just fill out the form below to be sent the details! A slouchy, worsted weight hat that’s perfect for those who prefer a little texture with their literary puns. Borne of a love/hate relationship with the herringbone stitch, after a few rows of herringbone, this fun knit surrenders and segues into a playful mock herringbone, keeping the smiles going as you knit the twists and turns. Retki is the Finnish word for excursion. Whether you take your Retki Hat camping in the mountains, apple picking on a farm, or to cover your hair for school drop-off, it is the perfect hat for any outing. With its simple construction and comfy slouch, the Retki Hat will be your new go-to hat pattern. Best knit in a soft yarn with a nice drape, this versatile hat is suitable for both men and women and looks great on just about everyone. The wide rib brim contributes plenty of stretch to fit a wide range of sizes. It’s a quick knit that you’ll want to knit again and again. It is written for knitters of all skill levels with tips on technique and how to adjust to your desired height and slouchiness. Knitters new to knitting in the round will appreciate the linked tutorial while the integrated garter ridges will keep more experienced hat knitters interested. This asymmetrical shawl has two options, a Kerchief version or a Shawl version. This pattern contains both versions, for the Kerchief, you simply bind off after completing Section Three. Each time there is a color change, the yarn is meant to be cut with a tail left for weaving in later. This cowl was created to mimic the movement and layering of the ocean; The slight waves are reminiscent of the marks left by the ebb and flow of water, and the embellishments are a picture of the organic growth of coral at the ocean bottom. Will you knit the cowl with or without the embellishments? When adding your embellishments, do they fold back and forth across the base of your cowl? Do they swirl up one side? Do they follow the waves already established, keeping the movement going instead of breaking it up? I hope this knit brings you joy and helps you express your inner creativity. The cover was designed for a 16” (41 cm) pillow form with extra width on the sides to accommodate button holes. The buttons make for easy removal of the pillow form so you can wash the cover! Sitting by the winter fire, knitting this shawl while listening to a Bon Jovi cd, I felt calm and happy. This is knitting I thought, creating joy, comfort and warmth with every stitch. Hence the Lost Highway Shawl was born. This is a soothing winter knit, creating a piece either using up nuggets from your stash or specially selected colours that you feel good in. I hope you enjoy knitting Lost Highway as much as I enjoyed designing it! Asymmetrical triangular scarf/shawlette comprised of modular mitered steps. Worked in garter stitch in self-striping yarn. The clever staggered mitre shaping brings a retro feel into the current day and makes a stunning yet simple accessory. “The Cornus Suecica Shawl” is inspired by this cute little flower that grows by the sea and high up in the mountains. The pattern of the Cornus Suecica Shawl has a right-leaning slant and an asymmetrical shape that increases by 1 stitch every RS row. Each RS row has an increase at the beginning, and each WS row has a decrease at the beginning and an increase at the end. In no time at all, you can be enjoying your new Cornus Suecica Shawl! This baby sweater was inspired by the blooming gardens in the spring. I love all four seasons, but I do believe spring is the prettiest time of year, when the weather is just warming up and the world is awakening from a deep sleep. Sunshine, flowers and smiles! A combination of Seed stitch and Moss stitch are used in this pattern. These stitches were chosen for their relevance in a garden. They are also both simple stitches which produce great texture. The color yellow was used in the sample to mimic the sunshine and warmth that fills us during the months of spring. The embroidered flowers complete this pattern with added cuteness, making this the perfect hand knit item in your baby’s spring/summer wardrobe! The Dandelion Shawl was inspired by childhood memories of lying in fields of dandelion blossoms on summer days, blowing dandelion puffs to make dreams come true. This is a perfect pattern for new shawl knitters and a wonderful addition to any wardrobe for those cool, summer nights. What better way to spend an evening than wrapped up in dreams? The delicate Dandelion Stitch border complements the flowing lines of garter stitch in this delightfully feminine, crescent-shaped shawl. Choose yarn in 100% wool in two contrasting, solid colours to showcase both drape and contrast. This is a really easy design entirely knitted on both sides - no purling! The floral border looks like complicated lace but is in fact a simple, elongated stitch pattern, which is very easy to memorise. I love to walk on an empty beach when it is cold outside, feel the fresh air in my hair, breathe deeply, the sounds of the waves gently lapping on the sand… Mmmmm ! So relaxing! I tried to put these feelings in a cowl. I love to have a squishy sweet knit cowl on my neck. This is a nice project to reduce your stash. Quirky Hand Knits: Diamonds Rock! This beautiful triangular shaped shawl has diamonds cascading from throughout. Starting with small diamonds, the lace pattern builds to diamonds within diamonds, before finishing with large diamonds and a lace edge. With full written and charted instructions this pattern is suitable for adventurous beginners as well as more experienced knitters. Just one skein of 4ply yarn is needed to create this beautiful addition to your summer wardrobe. This is my debut pattern and as it is also perfect for debut knitters, I called it Debiutantka which means in Polish debutante. This is a triangular shawl, knitted from side to side, mainly in garter stitch with the lace section at the end. This pattern can be used as the „destasher” for single skeins. It is designed for three colours, but also looks good as a two- or a one-colour piece. These socks are knitted in the round, top down, in a simple lacy pattern, with a heel flap and gusset. I would recommend a solid or gradient yarn, or a variegated with long colour changes, as the lace pattern may get ‘lost’ in a highly variegated yarn. Meet the Alpine Haze shawl, a feather light wrap made out of mohair yarn. It may be thin, but it will still cover you with a welcome layer of warmth. A beautiful shawl to gift! Knit on 4 mm needles, it is a fairly quick knit. The simple lace pattern is easy to remember, which makes for a perfect TV-knitting project. As many of us know firsthand, wind is a powerful force. It can cause great destruction in a matter of minutes. But wind can also bring forth more gradual, graceful changes in nature. I was inspired by windswept trees with their branches gently arching backwards as if they are allowing the wind—and time—to pass. These trees bear the brunt of each blast yet continue to hold tight and thrive. We just might learn a thing or two from them. Windswept Forest is a cowl knit in the round using a simple lace pattern; both charted and written instructions are provided. The yarnovers and decreases combine to evoke gnarly branches on purled trunks. A bonus is that this stitch pattern, while not truly reversible, looks great on the wrong side; strong trunks stand amidst countless tangled branches. The alternating columns of purl and knitted lace act as ribbing that prevents rolling, so there is no need for a top or bottom border. If joining the first round is tricky for you, I have a nifty trick for resisting the twist. With its beautiful crescent shape and delicate lace border, Alexanda is an elegant and feminine shawl and sure to become a favourite. Knitted in one piece from the bottom up, it’s a quick and simple pattern and a delight to create. Alexanda was created to be knitted with The Australian Wool Stores’ hand dyed luxury yarn – 50% silk/50% merino. Often, the hardest part about writing newsletters and blog posts is having something to write about. I’ve been staring at this screen for quite a while now, and for this entire week I’ve been mulling over what to write about! That makes for a great start to my brand relaunch, huh? There are moments when I’m hit by inspiration and it’s enough to fuel me for a few weeks, which feels amazing. But more often than not, I feel like my head is an empty shell—nothing is coming to mind! Coming up with an idea is hard for me. Thankfully, I’m good at executing tasks, and making whatever idea I have a reality, but it’s just that first step for me that is really difficult—coming up with an idea in the first place. As a knitwear designer, I had to learn quickly how to kick-start the creative juices, because I work a lot with yarn makers and dyers. I can’t let myself spend an entire month rolling around on the floor pulling my hair out, waiting for an idea to come to me. I have to go out and look for it—I’m on a deadline! I like to play simple games to get my mind going, such as word association games. I’ll look at the yarn, taking note of the color, weight, fiber content, and then write down any associated words that come to mind, even if it’s just one word. For example, I’m working with a lovely DK weight cashmere yarn, in a gorgeous purple colorway, from mYak (no, not a typo) yarns and it immediately screamed to me: TEXTURE! Even if it’s just one word, that’s enough for me to start creating a design piece. Textured stitches? I have some stitch dictionaries that I can leaf through to see what pops up. So what do you do when your inspiration is low? What busy and stressful these past few months have been! Between traveling back to the States for a visa renewal, hosting a second round of the 5 Shawls, 5 Days challenge, taking part in Master Brand and really taking a good look at what it is I want to do and where I want to take Aroha Knits, I am exhausted! But I'm also on fire and excited to be pushing Aroha Knits into a new direction. So what's new? Well let's start with the obvious, the MAJOR facelift. Before Aroha Knits was pink, now it's blue! I've been working closely with Chelsea Fitch of knitfitch.com on my visual branding - she not only created my new logo, but she also helped me determine my visual story, the colors, the imagery, the feel... I'm still working on updating my Instagram to be taking that same direction, but my website finally feels as it should be! Yay! You'll also hopefully find that it's much easier to navigate around now. Depending on who you are and what magic you like to create (knitters, aspiring designers and indie yarn dyers), you'll find a section catered to you and how you would like to experience Aroha Knits. My patterns have also gotten a change as well. You'll be able to see the new look in the FREE download I have for you in this blog post. But I think the biggest change and shift that Aroha Knits has experienced is... my why. Why do I do what I do? What drives me? What's my mission in this industry? What mark do I want to leave behind? I shared my story on Instagram but I'm going to write it here again for you to take it all at once. My mission is to evolve and to grow. I am passionate about the transformative magic of knitting in all its forms; from transforming yarn into unique hand knit designs, to transforming my life from dissatisfaction to fulfillment, to empowering other magic-makers to make similar transformations. I love putting myself right in the middle of the creation process of transforming yarn into a unique hand knit design. Watching and feeling the stitches coming together to create a tapestry of color and texture is such a magical feeling, one that’s easy to get addicted to and lost in, and it’s always an extremely satisfying moment when I take my project off of the blocking mats and think, “Wow, I thought of this idea and I made it come to life!”. Designing quietens my anxiety and combats depression, and honestly, it also makes me feel productive and that I’m contributing to the betterment of society. I incorporate personal stories and my cultural heritage into my designs so that I don’t create “just another pattern”, but something with meaning and significance, to leave a long-lasting mark in the fiber community. I want to leave my legacy in the fiber community, even after I’m long gone, to be known as the designer who drew upon her Maori heritage to create unique designs. I strive for a life of financial self-reliance on my design work, so I can continue to do what I love the most, making transformations happen. Like Merlin of Camelot, I like to lock myself away in my tower for days in order to create magic without distraction, then venturing out at the end to share my creations, and knowledge, with the community. Designing transformed my life from dissatisfaction to fulfillment, so of course I have the drive to do the work needed in order for me to be able to continue to do so. It’s challenging to make a living as a designer in the industry’s current state, but I want to play a part in shifting the perception that a designer’s work is worth paying for and that we are unapologetic about making it a career choice. Part of creating magic is teaching others how to use their internal spark to manifest their own transformations. I don’t want to keep what I’ve learned all to myself - it’s greedy, selfish and only serves to hinder me in the long run. “A rising tide lifts all boats”. That’s why I strive to be generous with my knowledge of knitting and design; being a catalyst for people’s transformations is extremely rewarding and empowering the community, even a little bit a time, strengthens the fiber industry as a whole. Because I’ve experienced first hand the rewards that knitting and designing have brought to my life, not just financially but also mentally and emotionally, I want to empower others to push past their fears and self-doubts to discover the same rewards for themselves, whether it’s in knitting or designing. There is magic to be found in both knitting another designer’s pattern and creating your own; both involve transforming yarn into a project you can feel proud of, boosting your confidence and creativity. It doesn't matter how: use your creativity to make transformations happen! Transforming yarn, transforming my life and transforming you: it’s these three aspects that help me leap out of bed every morning and push me past my own fears and self-doubts to ignite magic and spark transformations. So, in honor of my new mission of making transformations happen, here's a free pattern for you to download so you can start transforming your yarn too! This pattern has been fully tech-edited, test knit, complete with photos and a special link to a private page for video tutorials on any of the more fiddly stitches. So you're basically getting the quality of a paid-for pattern, for FREE! I would love to hear your thoughts magic-makers! Do you love the change as much as I do? I feel so excited to be taking you on a new journey with me!